Bainbridge Colby was an American lawyer, a founder of the United States Progressive Party and Woodrow Wilson's last Secretary of State. Born in St. Louis, Missouri, Colby graduated from Williams College, then attended Columbia Law School and New York Law School. He was admitted to the New York bar. He was a member of the New York State Assembly from 1901 to 1902. In 1914, he ran on the Progressive ticket for U.S. Senator from New York, but was defeated by Republican James W. Wadsworth, Jr. In 1916, he ran again, this time on the Progressive and Independence League tickets, but was defeated by Republican William M. Calder. He supported the President's policies firmly while the President suffered from severe side effects of a series of strokes. He supported the League of Nations and established a precedent for not recognizing newly Communist Russia which remained in place until 1933. 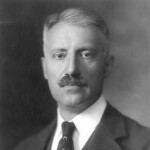 He was a partner in Wilson's law firm from 1921 until 1923 and continued with the law for the remainder of his career. Prior to his death in 1950, Colby was the last surviving member of the Wilson Cabinet.